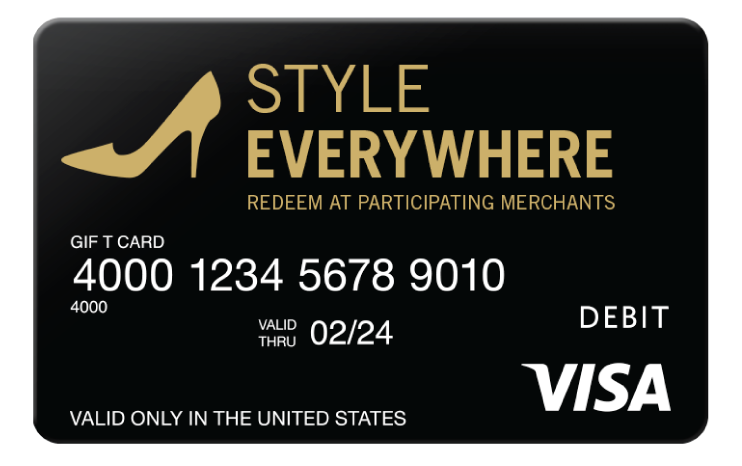 Use the Style Everywhere card at any boutique, shoe store, department store, and online fashion retailers everywhere Visa debit is accepted. From uptown chic to relaxed classic, this card has your style covered. Use your Style Everywhere Visa® Gift card at any fashion retailer everywhere Visa debit is accepted, even online! How do I use my Visa Gift Style Everywhere Gift Card? Your Card can be used to purchase apparel, accessories, shoes and more at any fashion retailer in the US where Visa debit cards are accepted. The amount of every purchase you make will automatically be deducted from the value on the card. You must register your Card to use it online. Yes, your Card will no longer work when the “valid thru” date printed on the front of your Card has passed. If funds still remain on your card after that date, please call 1 (877) 341-5484 to have a replacement issued and mailed to you at no cost. The balance on the replacement card will be equal to the balance on your discontinued card. If you wish to dispute a transaction on your card account, you should always first try to resolve your dispute with the merchant. If that doesn't work, please go to www.styleeverywheregift.com/dispute for more information.